Before there were weekly TV shows, there were movie serials released as weekly episodes, typically in twelve installments, shown as part of the “short subjects” that preceded a feature film. 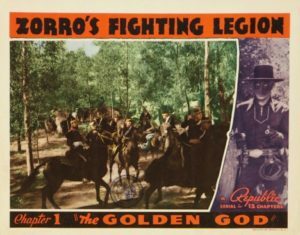 Zorro film adaptations usually have a distinctive historical setting, more colonial New Spain than Old West. Not so the Republic Zorro serials of the 1930s and ‘40s, most of which are basically standard Westerns that happen to feature an outlaw swashbuckler, and in which Zorro relies on a six-gun rather than a sword. The exception is Zorro’s Fighting Legion, which is set in Mexico in 1824 and features the Zorro we know and love, the fop Diego Vega who dons black mask and sword to fight oppression and injustice. Unfortunately, it has all the flaws for which the Republic serials are notorious: the plot is thin, obvious, and repetitive, the characters are cardboard, production values are bottom of the barrel, and whoa, the acting…. Zorro is played by Reed Hadley, an actor at the high school drama level—which puts him above the rest of the cast, whose only skills seem to be riding, fighting, running, fencing, and falling over when powder kegs explode. That’s mostly fine, since frenetic action takes up 90% of this serial’s screen time, and the actors just speak to each other briefly in order to set up the next deadly peril. The only exception is the villain who plays Don-Del-Oro, the boss bad guy who thunders his orders in a stentorian announcer’s voice from inside a golden god’s awesome but towering and ungainly metal mask. The rest of the cast are just glorified stunt men. But hey: good stunts! The story is scarcely worth summarizing. The new Mexican republic needs gold from a certain mine to establish its government, but disloyal politicians in the service of a criminal mastermind want the gold for themselves. The top crook masquerades as Don-Del-Oro, an ancient god of the Yaqui tribe of Native Americans, come back to lead them against the white men. Zorro arrives to save the day, and since the local government is corrupt, he forms a “fighting legion” of citizens loyal to the republic to oppose them. The best thing about this fighting legion? They have a theme song! Whenever Zorro calls for them to gather, they leap on their horses and gallop to join him, singing, “We ride … men of Zorro are we!” I think it’s the first-ever Zorro song. The portrayal of the Native Americans here is sad and unfortunate. In previous films Zorro was a friend and defender of the oppressed natives, who were depicted with dignity and sympathy. Not here: the Yaqui are superstitious savages easily fooled and led astray by the villains. Only the good white men can straighten them out. Despite this, there’s some stupid fun to be found in this three-and-a-half hour gallop-fest, especially if you’re under the age of thirteen or under the influence of powerful cold medications. Gunpowder must have been easy to come by in old Mexico, because damn near everything gets blown up; if a wagon strays near a cliff you can be sure it’s going over it; there’s a subterranean flood, beehive grenades, a peg-legged jailer, and as a sort of Zorro-signal, brush arranged on hillsides in giant Zs that are set afire to summon the hero or his legion. Plus, the music by William Lava, who composed a frantic Mexican-tinged gallop, is surprisingly good. Could be worse.